Friday marks the 28th day of the partial government shutdown affecting more than 800,000 workers. Lawmakers have made several attempts to alleviate some of the financial strains on feds, but there is still no end in sight to the appropriations lapse. At GovExec, we can't report on all aspects of the shutdown. Here is a roundup of reporting in other news outlets. 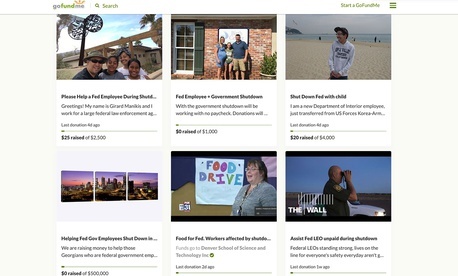 We noted earlier this month that dozens of federal employees have set up GoFundMe pages to help them make ends meet during the shutdown, but USA Today spoke to ethics experts who said that crowdfunding may violate gift-giving rules that govern federal employees. Virginia Canter, chief ethics counsel for Citizens for Responsibility and Ethics in Washington, told USA Today that the GoFundMe-type pages are "a potential minefield.” Tyler Cole, legislative director at Issue One, said he hopes that the Office of Government Ethics uses compassion and "common sense" if or when it addresses the potential ethics violations brought up by the crowdfunding. Read more here. More than 100,000 federal employees use the Washington Metropolitan Area Transit Authority's SmartBenefits system to pay for their mass transit needs, so WMATA announced that it has extended the deadline for agencies to change the benefit status for furloughed employees. WMATA announced the change on its site Thursday. Federal employees can use the SmartBenefits site to log in and see their SmartBenefits status on or after Jan. 22. The Federal Aviation Administration's academy is located in Oklahoma City and it was one of the first agency services to be shuttered during the partial shutdown. Oklahoma City Mayor David Holt spoke to Judy Woodruff to emphasize the impact of the shutdown on his city, including the FAA trainees who will not graduate. Holt noted that the city has "students that were here for a temporary amount of time to train" who are behind on their leases because they expected to have finished training. Holt also said there is already an air traffic controller shortage in the United States and the academy was hoping to graduate 1,500 controllers. It is on track to fall far short of that number. Watch the interview with Holt on PBS' YouTube Channel. The magnetic North Pole has been moving at approximately 30 miles a year and scientists have not been able to post an update to the World Magnetic Model because of the government shutdown. An update was scheduled to be released this week, according to The Washington Post. Cellular phone GPS systems and military navigators use the World Magnetic Model, but the lack of an update will most likely only affect "people trying to navigate precisely and at extremely high latitudes," the Post reported. The World Magnetic Model is normally updated every five years to accommodate the polar shifts, but the change in the North Pole hastened the one scheduled for this week. Read more at The Washington Post.